The very first stop-over of any foreign tourist in Hanoi is always Van Mieu-Quoc Tu Giam – Location near old quarter of Vietnam (translated as Temple of Literature), which reveals the Hanoians’ spirit of study in the past! Tourists, particularly the foreign ones, now flock to the site for taking a look into its profound traditional meanings of both a Confucion temple and the first university of Vietnam. Văn Miếu or Temple of Literature, known as “pagode des Corbeaux” during the period of French colonisation, was founded as a Confucian temple in 1070. Only parts of the Văn Miếu complex date back to the earliest period, although much of the architecture dates to the Ly (1010 – 1225) and Tran (1225 – 1400) Dynasties. 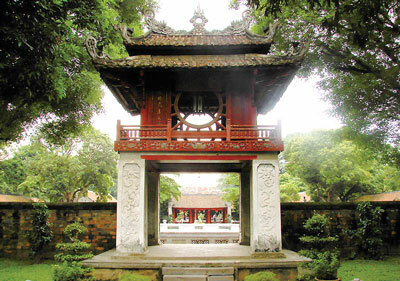 In 1076, Vietnam’s first university, the Quốc Tử Giám (or National University), was established within this temple to educate Vietnam’s mandarin class. The university functioned for more than 700 years, from 1076 to 1779, during which, 2,313 doctors graduated. Hence, the complex has been attached to the name of Van Mieu-Quoc Tu Giam up to now. 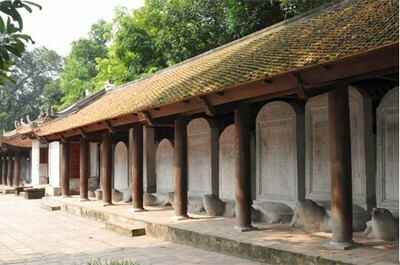 This ancient Confucian sanctuary is now considered one of Hanoi’s finest historical and cultural sites. “The ever special architetural style of Van Mieu dates back to the 11th century, evoking an inspiration of classical creativeness of many of us”, one of my tourists remarked. Just take a look into the art of architecture, you will share the feeling! The temple is based on Confucius’ birthplace at Qufu in the Chinese province of Shandong. It consists of five courtyards lined out in order, entrance to the first, via the impressive twin-tiered Van Mieu gate leads to three pathways that run through the length of the complex. The centre path was reserved for the King only, the one to its left for administrative Mandarins and the one to its right for military Mandarins. The first two courtyards are peaceful havens of ancient trees and well-trimmed lawns where the scholars could relax away from the bustle of the city outside the thick stone walls. Entrance to the third courtyard is through the dominating Khue Van Cac (constellation of literature), a large pavilion built in 1802. Central to the this courtyard is the Thien Quang Tinh (“Well Of Heavenly Clarity”), either side of which stand two great halls which house the true treasures of the temple. These are 82 stone steles. Another 34 are believed to have been lost over the years. They sit upon stone tortoises and are inscribed with the names and birth places of 1306 men who were awarded doctorates from the triennial examinations held here at the Quoc Tu Giam (“National University”) between 1484 and 1780, when the capital was moved to Hue. The fourth courtyard is bordered on either side by great pavilions which once contained altersl of 72 of Confucius greatest students but which now contain offices, a gift shop and a small museum which contains ink wells, pens, books and personal artifacts belonging to some of the students that have studied here through the years. At the far end of the courtyard is the altar with statues of Confucius and his four closest disciples. The fifth courtyard contained the Quoc Tu Giam, Vietnam’s first university founded in 1076 King Ly Can Duc, but this was destroyed by French bombing in 1947. Though having gone through lots of restoration work, the temple still retains its very first original shape, to be one of the visit-worthy sightseeings of Hanoi Viet nam, captivating to a huge number of tourists elsewhere. A space of peace, green trees and solemnity covers the whole temple of historical and traditional love for study, making tourists feel like they were lost in a land of Confucion and traditional values. If you are in Hanoi, you should really come and explore it yourself! Being an ancient school of Thang Long and the first university in Vietnam, Temple of Literature is acknowledged as an ancient historical-cultural heritage which gives tourists deeper understanding about Hanoi’s years of culture and tradition. Tourists should definitely add the Temple of Literature to their visiting list in Hanoi. It is included in a lot of Hanoi city tours as one of the main attractions in this bustling capital city. Coming here, tourists might see many Vietnamese students visiting the places as a ritual for good luck before they enter an important exam such as the entrance exam into college.